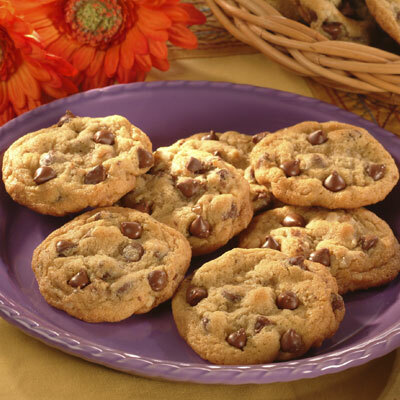 Try Original NESTLÉ® TOLL HOUSE® Milk Chocolate Morsel Cookies. You'll love this traditional American cookie with a Milk Chocolate twist! COMBINE flour, baking soda and salt in small bowl. Beat butter, granulated sugar, brown sugar and vanilla extract in large mixer bowl until creamy. Add eggs one at a time, beating well after each addition. Gradually beat in flour mixture. Stir in morsels and nuts. Drop by rounded tablespoon onto ungreased baking sheets. BAKE for 9 to 11 minutes or until golden brown. Cool on baking sheets on wire racks for 2 minutes; remove to wire racks to cool completely. Grease 15 x 10-inch jelly-roll pan. Prepare dough as above. Spread into pan. Bake for 20 to 25 minutes or until golden brown. Cool in pan on wire rack. Makes 4 dozen bars. Prepare dough as above. Divide in half; wrap in waxed paper. Refrigerate for 1 hour until firm. Shape each half into 15-inch log; wrap in waxed paper. Refrigerate for 30 minutes. * Preheat oven to 375° F. Cut into 1/2-inch-thick slices; place on ungreased baking sheets. Bake for 8 to 10 minutes or until golden brown. Cool on baking sheets for 2 minutes; remove to wire racks to cool completely. Makes about 5 dozen cookies. *May be stored in refrigerator for up to 1 week or in freezer for up to 8 weeks. Increase flour to 2 1/2 cups. Add 2 teaspoons water with the flour; reduce both granulated sugar and brown sugar to 2/3 cup each . Bake at 375° F.: drop cookies for 8 to 10 minutes and pan cookie for 17 to 19 minutes.